This long-simmered pot roast is a tasty combination of red wine, tomatoes, and mushrooms. It's great with potatoes or you can serve the beef and its sauce over hot cooked pasta. 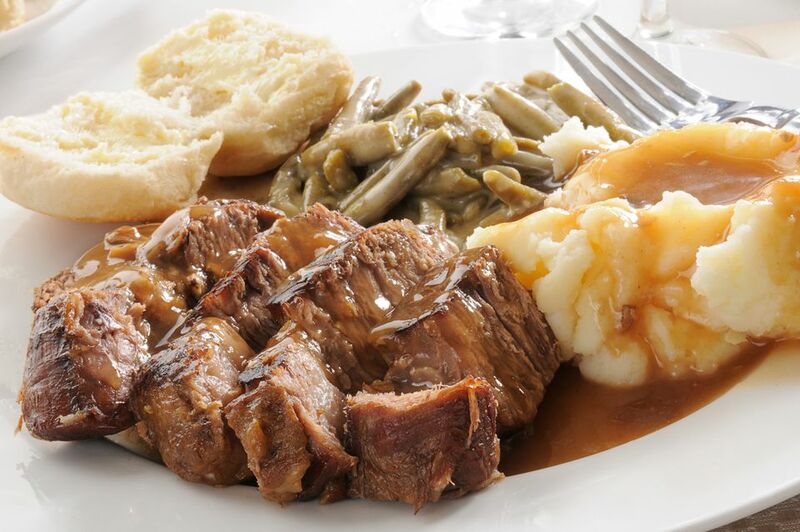 Serve this delicious pot roast with mashed potatoes or rice and your favorite vegetables, green beans, or a lightly tossed green salad. In a large stockpot or Dutch oven, heat the olive oil over high heat. Combine flour with salt and pepper; dredge the pot roast in the mixture. Brown the roast quickly on all sides in the hot oil. Add the onions, celery, and mushrooms; reduce heat to medium and saute, stirring frequently, for about 2 to 4 minutes. Add the thyme or marjoram, bay leaf, chicken broth, wine, and tomatoes; bring to a boil. Reduce heat to low; cover and simmer for 2 to 2 1/2 hours, or until the beef is very tender.